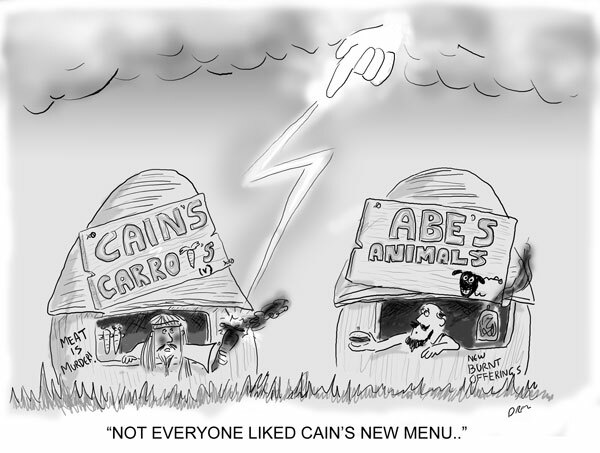 Adam and Eve / Noah are all cartoon regulars so I thought I'd bring some less well know Genesis characters to this week's CCGB compedition whose theme is 'Vegetarianism'. Okay it's a stretch given the story in Genesis 4 only says Cain was a farmer and Abel was a hunter. Also as all the commentaries will say it's not really about divine disapproval of vegetarian vs meats but rather the attitude behind the offerings. Yes and Cain did murder Abel but that's another story.